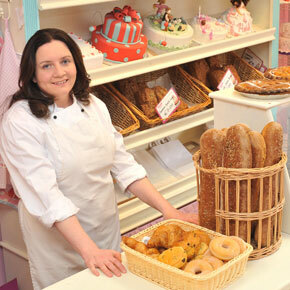 Yvonne Higgins-Murphy, who opened Devour Bakery in Ballinrobe last July. What do you get when you add a cup of tenacity, with equal parts of determination and hard work and a sprinkling of business acumen and mix it all together? Devour bakery owner, Yvonne Higgins-Murphy. The Neale native has created what seems to be the perfect recipe for a viable business in Ballinrobe in these recessionary times. According to herself, the main reason for her business’ success is the quality of service and simplicity of the goods she supplies. “Eighty per cent of it is product and 20 per cent is the people that work here. The specialised cakes and the cupcakes go well for occasions but the main things that people keep coming back for are our apple tarts and soda breads,” explained Yvonne, adding she makes up to 300 of each, per week. Devour opened its doors in July 2012 and has been proving a firm favourite with the coffee and cake lovers of Ballinrobe and beyond. A civil servant turned baker may not seem like the most natural of career progressions, but Yvonne has proved it can be done. Since June 2012, the talented baker has been on a career break from the civil service, where she works with Pulse, the computer system used by An Garda Síochána. While tucking into one of Devour’s sumptuous cupcakes and a large Americano, it became clear to me that she did not enter the baking business on a whim, however. Yvonne always dreamt of being a chef, She attended Tourism College in Killibegs, where she trained as a chef, winning numerous medals in national competitions for decorating gâteaux, soufflés and plated desserts. She also won a scholarship to Johnson and Wales University in Providence, Rhode Island. After polishing her talents at the prestigious Dromoland and Ashford Castles, she then added managing the bakery and pastry department of a well-known supermarket to her CV, and later Sales Rep with Cuisine de France. Yvonne runs Devour with her husband, James, a former construction worker. James goes on the road, selling and delivering the Devour delicacies that Yvonne produces. Both have the 100 percent committed work ethic it seems to take to open a business in a recession. Astonishingly, though, Yvonne sees their life now, even with its 12 hour days, as a welcome rest. But that probably has to do with the fact that it all began when she still had her job at Pulse. She and James had been struggling to make ends meet. It had got to the stage that they couldn’t afford to put diesel in the car. Baking was now just a hobby for Yvonne. Then one evening in May 2011, she decided to put up some pictures of some cakes she had made on Facebook. In a few hours, she had two orders. The infectiously warm and enthusiastic bakery owner said she built her business from there, ‘tipping along’. But that makes it sound as though she was dabbling. She wasn’t. She was hard at it. She would come home from work at Pulse at 11pm at night; bake cakes and apple tarts until 4am; catch three hours’ sleep; and go back into work. And what’s more, she kept this up right up to the day Devour opened its doors. Yvonne and James’s attitude to work would have Sir Alan Sugar wilting. A ‘win, win situation’ as she calls it now, Yvonne is content with her improved quality of life. She loves the homely atmosphere she has created in the bakery, where she’ll often sit down and have a cuppa with regular customers who she now sees as friends. Yvonne and James, determined to retain a local-focused business, provide many local grocery shops in the surrounding villages with their goodies. “If a multinational came begging I’d still choose the local shops,” Yvonne says. Devour recently received a glowing review from John and Sally McKenna of the Bridgestone Food Guides – a the cherry on top that is now in the form of a plaque that now takes pride of place on the Church Lane shop. Word of mouth about the review has spread, and next month, Yvonne, James and and two employees will be featured on RTÉ’s Nationwide. “They filmed three weeks ago for the whole day. It was amazing … like our wedding day all over again,” she explained, bursting with pride. While these successes are undoubtedly sweet, Yvonne has not taken her eye off the future of the business, showing that determination is the vital ingredient. “Every day I get up I say I’ll do as good as I did yesterday, and hopefully, I’ll do the same tomorrow.” A true recipe for success.